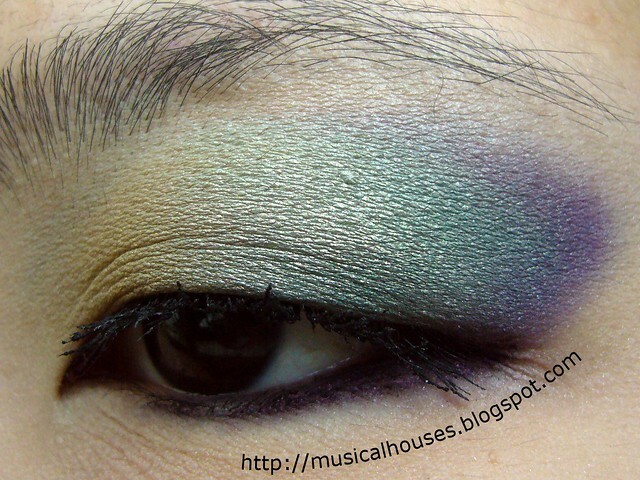 Chanel Peridot Inspired Eye Look: Gold/Green/Blue/Purple! After all the Chanel Peridot (along with its two dupes, OPI Just Spotted the Lizard and Sephora Diving in Malaysia) hype, I thought to myself, since I liked the Chanel Peridot colour so much, why should I limit myself to just wearing it on nails? I wanted to see if I could recreate the look or feel of Chanel Peridot on my eyes! 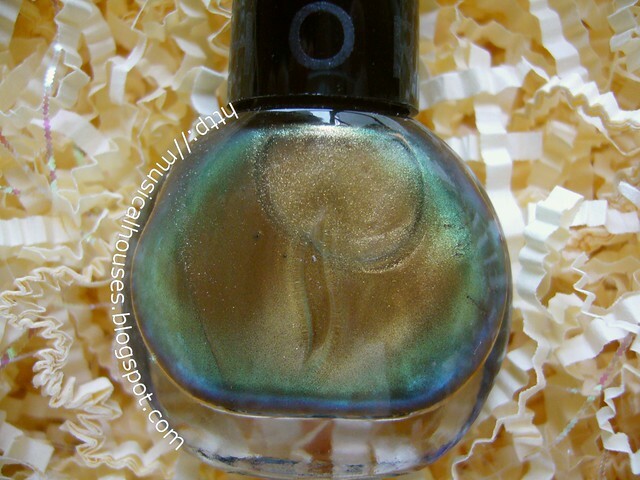 I was looking at my own bottle of Sephora Diving in Malaysia (one of the Peridot dupes - I'm cheap like that, but hey, my spending money comes out of my salary, aka money I actually have to earn), and I paid attention to the colours at the edge of the bottle, where you see the duochrome. To me, it looked as though the gold colour was ringed by concentric circles of green, blue, and purple, each blending into each other. Well, it's quite complex, but that was my oversimplified way of breaking it down. So, in order to recreate this look, I used a bunch of colours. I used Urban Decay Maui Wowie for the gold part, mixed with the tiniest bit of Sleek Screwdriver, from the Sleek Curacao Palette, to make it a little bit more yellow for colour accuracy. For the blue and the green I used two shades from an el cheapo Love Alpha Palette I got sometime back (middle two shades on the bottom row, if you really want to know). For the purple shade, I used the purple shade in my BeautyUK Day and Night Eyeshadow Palette. I don't know how much of each of the individual colours you can see (other than the gold), because I was trying to blend them one into the other - sort of like the nail polish. Anyway, I used the gold shade on the lid, and then added on the blue, green, and purple respectively nearer the contour area. And then I blended everything together. And that's it, really. I had to adjust some of the blending a little bit here and there to match my bottle of Diving in Malaysia a little more. It's not a perfect match, but it sort of looks like Peridot, right? Sort of? While this isn't normally a look I'd wear (or a colour combination I'd even think of making up), I think I quite like it. I wouldn't wear it out or anything, but I did have fun doing this look! This is really lovely, and very true to the nail polish. Love it! This is definitely something that I like so much! It looks not boring but not too much. Very beautiful! I love the blue and teal at the edges. It really is a lovely interpretation of the polish look into eyeshadow form. 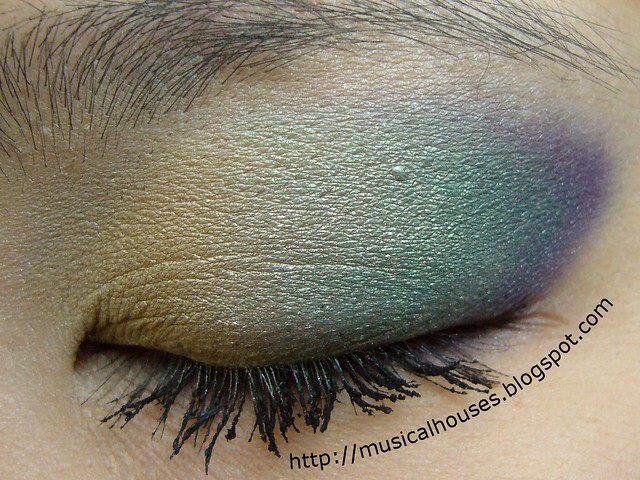 It captures the color shift but is also appropriate to the eye shape. I'd say this is a definite win! you did a great job of translating the colour over to your eye make up.. its very accurate in that sense...kinda wish we could see the full eye look on both eyes..it's really hard to gage the over-all eye make up look from just 1 eye (no face or anything lol) but im sure it looks smokin hot..just a thought though. This is gorgeous! Your look matches the bottle so well. Love the colours. Would love to wear this eye make up with the nail polish and a black outfit :D Wish I had a strong hand in make up. If you don't mind me asking, what brushes do you use? Im thinking of buying some beginner brushes for a reasonable price if you have any in mind, your help would be appreciated! Other than that, Ecotools also has good and cheap brushes. Another personal favorite of mine is Sonia Kashuk. I love Ecotools brushes, started quite a collection. I agree with others, you are very skillful with your eye colors.